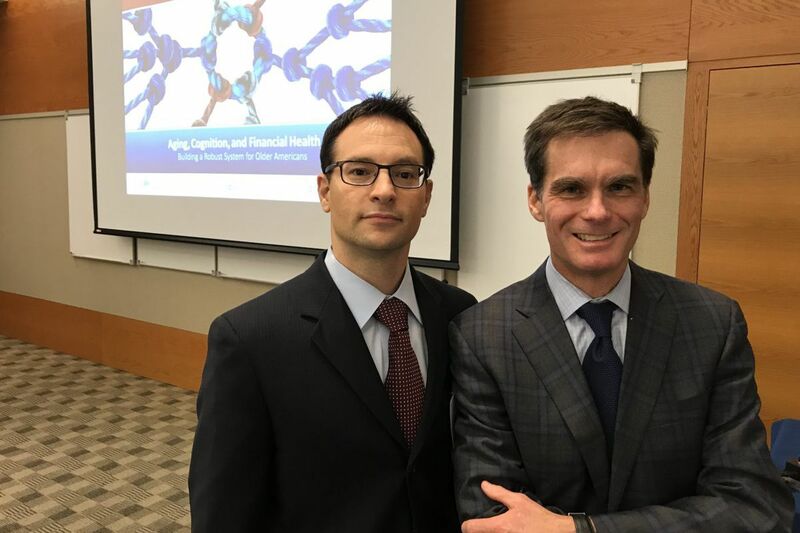 The Philadelphia Federal Reserve Bank’s Larry Santucci (left) and Dr. Jason Karlawish of the Penn Memory Center hosted the joint conference Nov. 28-29 addressing financial abuse among older Americans, specifically those with cognitive difficulties. At a groundbreaking two-day conference last week, the Federal Reserve Bank of Philadelphia and University of Pennsylvania doctors teamed up to address how banks, brokerages, and financial advisers can recognize and prevent financial elder abuse. The Philadelphia Fed, with the university's Healthy Brain Research Center and the Penn Memory Center, hosted "Aging, Cognition, and Financial Health: Building a Robust System for Older Americans." Penn Memory Center's Jason Karlawish opened by presenting research showing a correlation between decline in cognitive abilities in older adults and poor financial judgment, which may make them more vulnerable to exploitation and fraud. "This is not a problem that stands in isolation," said Philly Fed president Patrick Harker, citing this statistic: The number of 60-plus Americans taking on student loans quadrupled between 2005 and 2015, mostly on behalf of children or grandchildren. "More people living longer means more people entering retirement with plans that may have estimated a shorter life expectancy — on fixed incomes that could be further compromised by the health issues that become more common as we age," Harker said. The conference brought together banking-industry and elder advocates, plus public-sector representatives, to discuss strategies for protecting elders' financial health, and possibly ideas for putting together a national task force. In February, FINRA, the securities industry's self-regulatory arm, will allow broker-dealers to place temporary holds on funds or securities if they suspect financial exploitation. But there is no federal law preventing or punishing financial elder abuse. "While institutions want to help protect their customers … they're worried about the legal consequences of putting holds on suspicious electronic transfers and deposits because they're legally bound to expedite the process," Harker said. Banks and brokerages are reluctant to share information about potentially suspicious account activity with other institutions, for fear of violating federal and state privacy laws. Philadelphia Fed industry specialist Larry Santucci released a paper on data-sharing among financial institutions that could improve the financial health of older Americans, specifically those with cognitive difficulties. Karlawish, a professor at Penn's Perelman School of Medicine, interviewed Renee Packel, widow of a patient, Arthur Packel, about the signs predating his 2000 dementia diagnosis and their resulting troubles. "I didn't know anything was wrong until our homeowners' association called and said my husband hadn't paid our dues in three months," Renee Packel recalled. "He wasn't paying other bills, either, at his business. We had to hire a forensic accountant to find out that most of the money had disappeared. I was never so frightened in my life." She had to find a job after 60 years out of the workforce. Her husband had cashed out his IRA, she discovered, and they had to sell their home. Joseph Donohue, a retired engineer, is enrolled in a Penn Memory Center study. His mother was diagnosed at age 86 with dementia. "I decided to enter a clinical drug study because research makes all the difference," said Donohue, whose brain scan showed elevated levels of amyloids, a precursor to Alzheimer's. Paul Tramantozzi, a certified financial planner, spoke about his father's Lewy body dementia, and how his father asked him to handle the finances after noticing his own mental decline. "Your finances in retirement can be a land mine," Tramantozzi said. "Make sure to get a durable-power-of-attorney document, which allows your agent to manage your affairs even if you are incapacitated. Make sure to tell your CPA, your estate attorney, who that trusted person is, as well." Come February, broker-dealers also will begin asking clients to name a "trusted person" — like an emergency contact on medical forms — for all financial accounts, said Lisa Bleier of the Securities Industry and Financial Markets Association. But banks aren't required to ask for this information, which leaves gaps in regulation. Estimates of the cost of financial fraud against seniors range widely, from $3 billion to $36 billion annually. Red flags include large ATM withdrawals; wires for large sums; nonpayment of bills; certificates of deposit or accounts closing suddenly; inability to reach seniors by phone; overdependence on or fear of caregivers; and new "friends" or strangers in the person's home. And it's not just that seniors are losing assets — some are deep in debt. Research from the New York Fed and the Consumer Financial Protection Bureau show debt held by people age 50 to 80 increased about 60 percent between 2003 and 2015, Harker said. Banks may introduce products such as prepaid bank cards with limits that prevent seniors' accounts from being drained. Experts recommend getting duplicate statements of elderly relatives' accounts, monitoring their checking accounts using services such as Eversafe, or freezing credit at the major bureaus. If a relative resides in a nursing or personal-care home and you suspect fraud, advocates suggest contacting the long-term-care ombudsman. Call Philadelphia Corporation for Aging 24 hours a day at 215-765-9040 if you suspect abuse of any kind.